Notre Projet – What is Our project? on each person who contributes and to the growth of competitive profits as well as the growth of human well-being at work. Each and every individual in the life of a company interprets their own values of transcendence (see inner circle above) in which he belongs freely. This may mean the Creator, a Supreme Being (a Superior Power), God of Love, or again, God, the Son and the Holy Spirit, Allah, Jehovah, Buddhism, Hinduism, or any other beliefs related to spiritual values or any given religion. The latter, spiritual values or any given religion and its’ traditions, belongs to the 6th circle, or the center circle, in the illustration above. Each of the five arrows illustrates the relationship between the chosen values which moves in and out of the five groups in a loop fashion which in turn provides feedback on a constant basis. 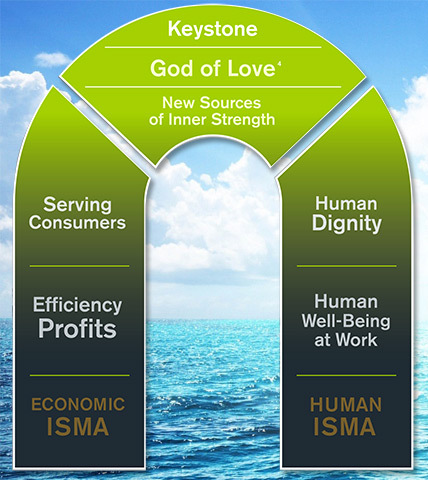 An ensemble of a variety of activities of the Human ISMA brings to the workplace these values. Again, these values must move within the center circle and hence are strengthened with the help of the Creator, the Supreme Being or a God of love or by any spirituality, religious tradition or transcendence chosen freely by the individual. In the last 50 years, especially in the Western world, business schools have developed Integrated economic Systems of Management Activities (ISMA-Economic). However, beginning in the year 2000, we see, in the world economic system, the emergence of three serious flaws which can bring us to the edge of an important world-wide social revolution.
. The first flaw is fraud and poor management on the part of companies. Secondly, there is a growth in dehumanization in the workplace. Third and last, there is an imbalance in the distribution of wealth in the world between the “very rich” and the “very poor” whether it be individuals, companies, nations or continents. In the above illustration of the Keystone, the left column is representative of the Economic ISMA. The right column represents the Human ISMA. The two columns, in constant tension with one another, are crowned by the Keystone. The Keystone symbolizes the many numerous values, which are profoundly human and spiritual, brought by the Human ISMA. 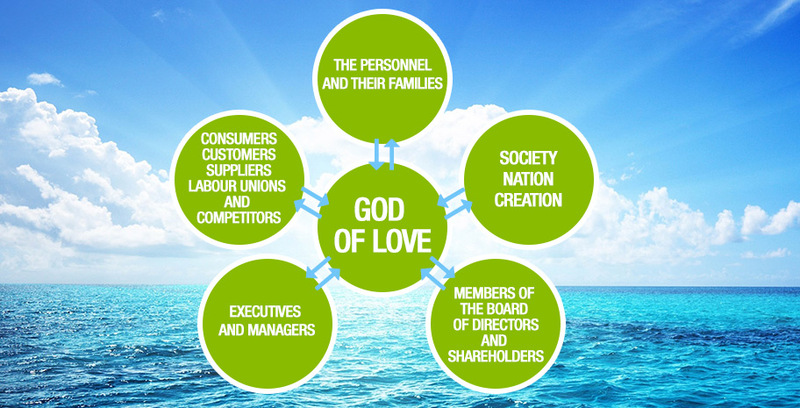 These values are representative of the chosen spirituality or religious traditions, God of love or the Supreme Being, chosen by each and everyone in a superb climate of freedom. Heart of flesh and not heart of stone. We therefore are meeting throughout the world with groups of executives, leaders, teachers and MBA students, to tell them about the experience of Our Project as well as to provide personal testimonies. Hundreds of people have also come to visit us, to meet our staff, in Montreal.